For decades, market researchers have relied on linear regression models to perform key driver analyses. These models are designed to reveal how a predictor, such as the use of particular product, may determine an outcome, such as the likelihood that a customer becomes a brand advocate who recommends the company’s products to their friends. 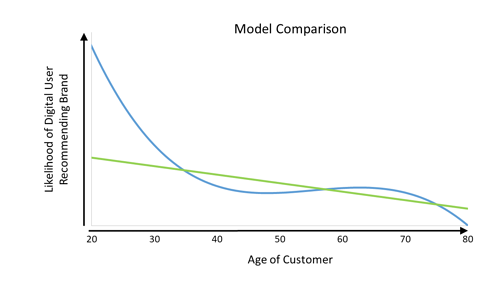 Some sophisticated models even include interactions that show how the relationship between a predictor and an outcome vary over some critical feature such as a customer’s age. The problem with this classic approach is that the relationship between the predictor and the outcome is assumed to be linear. Customer behavior is not always that simple. 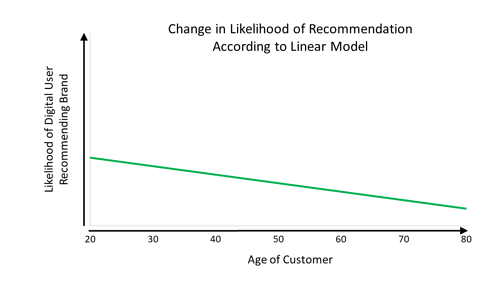 By using a nonlinear model, it is possible to gain a more accurate picture of how the likelihood of recommending a brand varies by age. A comparison between the two models reveals how linear key driver analyses may conceal valuable information. 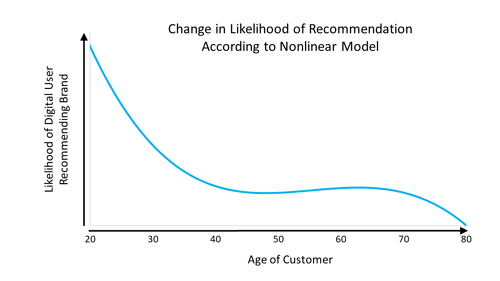 Nonlinear models help you hear the voice of the customer more clearly. They can be used to examine such issues as whether customer purchase patterns change after an important life event or whether today’s customers are behaving differently than the customers of previous quarters. The potential for nonlinear models is vast, but their application requires experience and technical know how. Find out more about how nonlinear models can help your business.